Did you think we were done talking about Rubber Bands? Well we aren't, there are lots more topics to cover, but this is the post about rubber bands for a while. If rubber band based projectiles and rubber band balls aren't edgy enough for you there are of course some more odd uses for them. As always, a simple mass produced product drives people to create works of art and rubber bands are perfect as they are available cheaply and in an array of colors. The artist/designer William Hodges came up with an interesting set of pieces made for some large walls at a Martini Bar in Denver. The Corner Office tries to go for a kind of after hours office theme (as near as I can tell) so the rubber band pieces fit the theme. Since I was only in Denver once in the 90's I don't know what kind of place The Corner Office really is, but their website makes them look legit enough. William's own page on the pieces doesn't attempt to read a lot of pretentious deep meaning into these pieces, so they should probably be appreciated as objects with a unique look and feel rather than be critiqued for their composition. He states that 40,000 rubber bands were used and I would assume that half of them were the white rubber bands and the other half were the multi-colored variety. I can only begin to guess as what rubber bands he used here, but by looking at the photos the rubber bands don't appear to be particularly shiny. That shine is an easy way to identify the PlastiBands that are sold at Arts and Crafts Stores since their unique composition lends them to different uses. 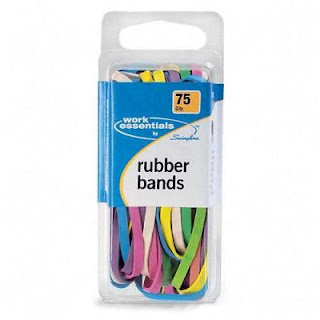 I'm going to assume that they are rubber bands made from actual rubber and judging by the size and color the closest I can come up with is the Swingline SWI71750 Rubber Bands. These come in multiple colors, appear to be an appropriate size and are made from rubber so they won't be shiny. In a drastic shift from the art world, it has come to my attention that many people do use the previously mentioned pallet bands as an economical substitute for the pricey resistance bands. While you can use them in the specific manner above, there isn't any reason you can't find other methods to work out using a pallet band. 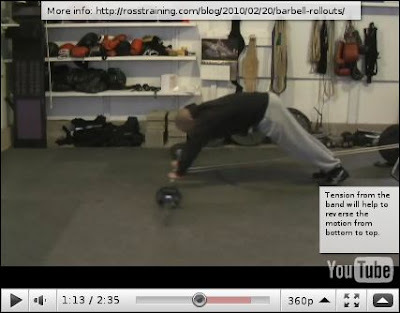 Just throw "Resistance Band" into your favorite search engine and you'll find scads of videos and articles describing exercises that can easily be duplicated with the Pallet Band of your choice. Unfortunately, you'll have to do your own measuring to find out what size you'll need.